Research: The bycocket, or chapel à bec as it was known in France, was all the rage in the 14th and 15th centuries in northwestern Europe, but it did continue on sporadically into the 16th century. 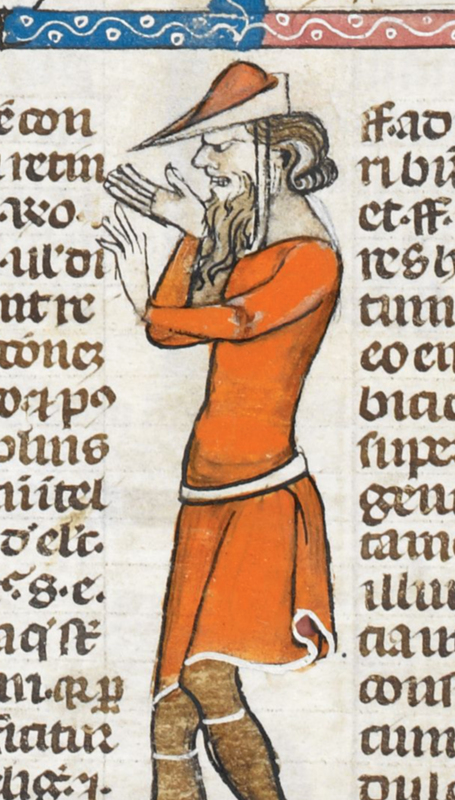 The bycocket shows up frequently in imagery of the time period, but my favorite image is found in margin of The Decretals of Gregory IX c. 1300-1340 written in Southern France (page 40v). 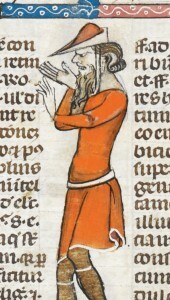 In the image, a man wears a red bycocket with a white lining. Another favored image with the same hat style and coloring appears in the 1344 painting “The Effects of Good Government in the Countryside” by Ambrogio Lorenzetti (rider on the left, note that her brim may be decorated). Materials: Dark red velvet (outside layer), white linen (inside layer), white linen canvas (interlining, for stiffness), wool batting (interlining, for shape), and white silk taffeta (outside brim layer). I used the canvas and wool batting to give the hat some solidity and structure. The order of layers from the outside to the inside is as follows: velvet, wool, canvas, linen. The silk taffeta was whip stitched onto the brim and only the brim in order to leave the white linen as the layer next to the hair (at Gregoire’s request), the thought being that it would be a touch cooler and easier to clean. Additional materials included silk embroidery floss (12 ply Splendor thread), silk sewing thread (Gutermann), and freshwater pearls. 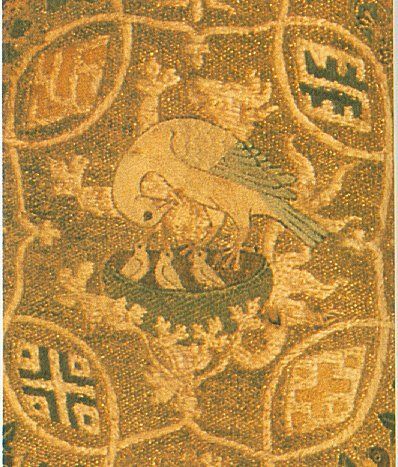 Embroidery: Inspiration for the embroidered pelican came from the Pienza Cope, a richly-embroidered cape worn by Pope Pius II and currently housed in the Diocesan Museum in Pienza. The cope dates to 1310-1340 and features a beautifully embroidered orphrey (medieval pelican). 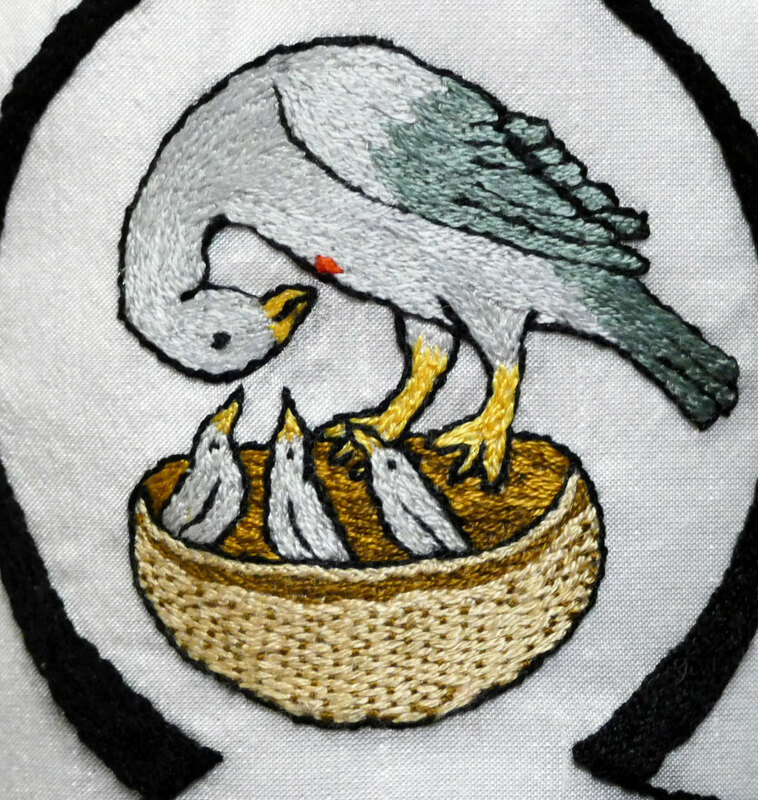 Like the original inspiration, I used split stitch and couched silk in my embroidery, which are some of the stitches used in opus anglicanum style embroidery. And as I wanted the embroidery to feel fine and regal, I used just one ply of the 12-ply silk to work the stitches. 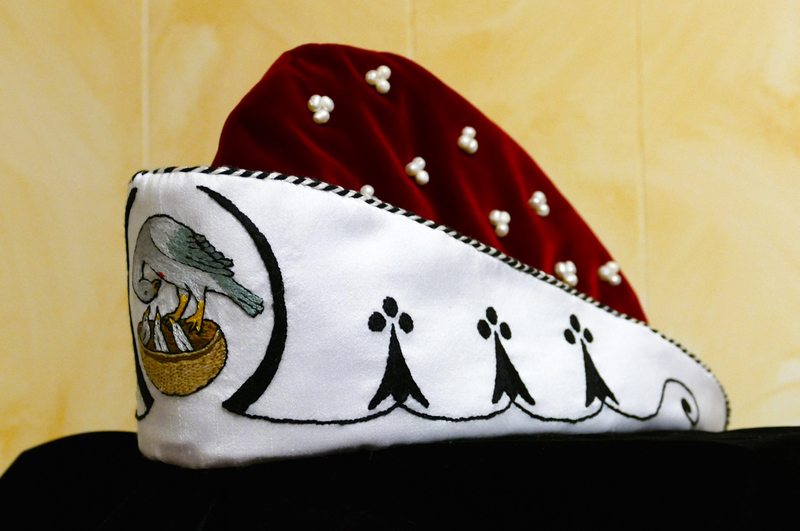 This was time consuming (altogether the hat’s embroidery took about 40 hours), but the result was very rich looking. The overall design, with the three ermines and the lines that connect them came from Mistress Melisant, who quickly sketched it on a piece of scratch paper and it was — of course — perfect!! 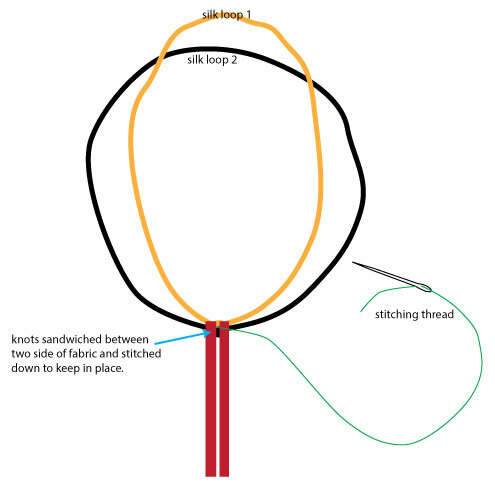 Step 1: Create two loops of silk thread in contrasting colors. 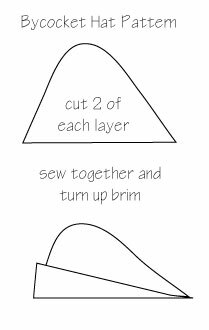 The loops should be at least as long as the seam you wish to stitch, plus a little extra. For example, the brim length was 33″, so I cut silk thread lengths of 80″ to fold in half and knot, producing 40″ loops. Step 2: Put the knots of the two loops between the two fabric sides where you wish to begin the seam. I sandwiched the knots in between the fabric, hiding them. Make sure your loops are not tangled in each other — you need the loops to move freely. 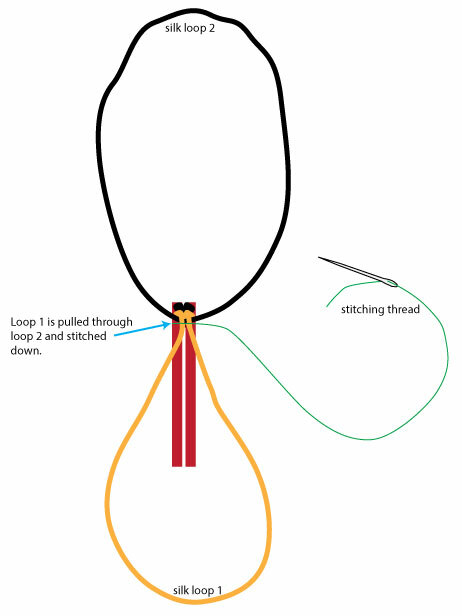 Stitch the knots into place with a single length of silk sewing thread. 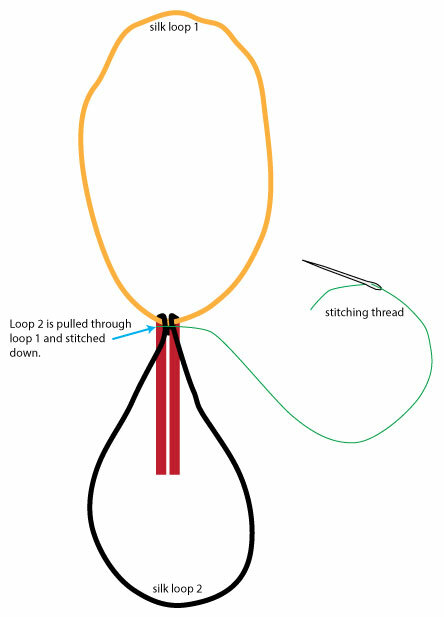 Step 3: Pull loop 2 through loop 1 and stitch loop 2 down, across the top of the loop 2. Step 4: Repeat step 3, but this time pull loop 1 through loop 2 and then stitch down loop 1. Repeat steps 3-4 until you are done! Finally, freshwater pearls were added on the top of the hat, inspired by this image of a beautiful recreation of 14th century bycocket. 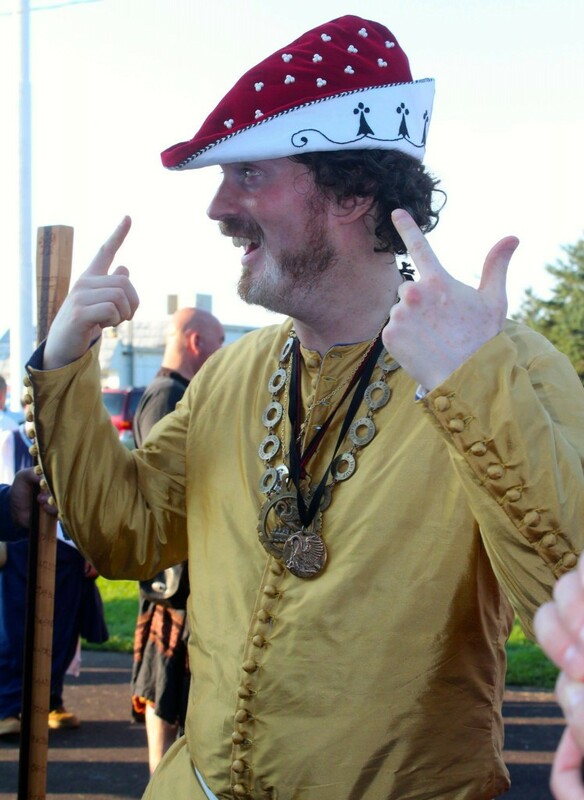 The gold silk cote was made by Mistress Giovanna, by the way — isn’t it beautiful? If you have questions, please post them here or e-mail me at genoveva.von.lubeck@gmail.com.